Being single can either be as a result of a decision, a failed relationship or the lack of available attractive options. Whatever the case may be, it is important to know that this season of love aka Valentine’s Day, doesn’t have to be lonely or boring for you. 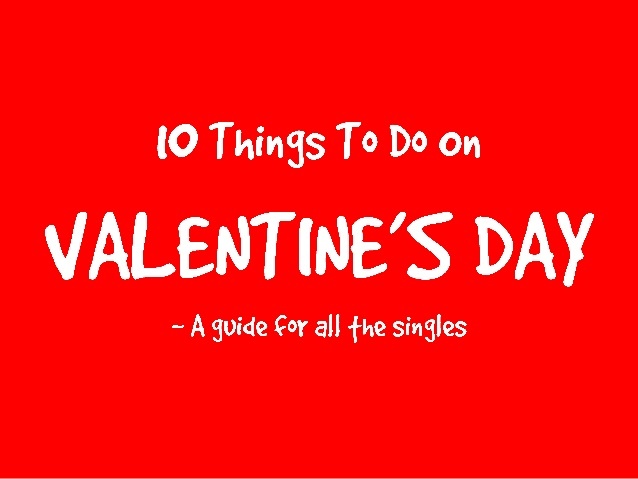 If you’re like a million more people and you’ve found yourself single this period, below are 10 things that should make sure you have a good time! 1. Make plans – time with friends, movie dates or just a dinner. Seriously, if you don’t make plans to do something you’ll end up home alone. Which could lead you to wallow in loneliness, crying, or eating way too much ice cream. Avoid this scenario and make plans already. 3. Whether you live with your parents or not, you can make plans for them. Cook a romantic dinner for them. Set the table, light candles, and open a good bottle of wine. 4. Stay in and pamper yourself. Take a long bath, give yourself a face mask, or paint your nails. 5. Treat yourself to a haircut, blowout, beauty treatment, or massage. 6. Have a movie marathon. Order pizza from your favorite pizza place, shake up a cosmopolitan, and binge-watch your fave movies that celebrates single women everywhere. 7. Plan a Valentine’s Day weekend getaway with a friend or family member or a date with your best friend. Get dressed up, go to a fancy restaurant, and order the best food and wine. 8. Send a heartfelt text to all the people you love in your life. Especially the old friend who lives far away. And those people you’ve been promising to check on. 8. Take yourself out to eat at your favorite restaurant. Sit at the bar and splurge on dessert. Drink Champagne! 9. Wear something festive – or if you’re more dramatically inclined, then go red – and feel the love. 10. Stay off of social media. Facebook-stalking your ex to see how they’re celebrating with their new S.O. is not going to make you feel happy or confident. Whatever you decide to do on that day, love yourself, do whatever makes you happy, do not stalk your ex, do not be bitter and surround yourself with love!